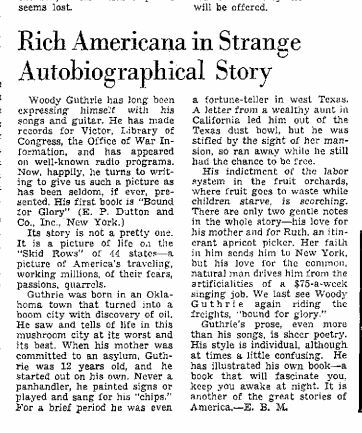 Woody Guthrie: Such a famous…. Writer? Woody Guthrie is an iconic folk singer and performer in American history. Most famously known for his performances of “This Land is Your Land,” Guthrie traveled the United States through the 40’s and 50’s singing anything from traditional folk music to anti-fascist songs about Hitler. However, I would guess that very few people would mention him as a prolific writer, or perhaps know that he wrote an autobiography (bonus points for those of you who did know). This newspaper clipping (the rest of the issue found here) comes from the Salt Lake Tribune in its May 30th, 1943 publication. 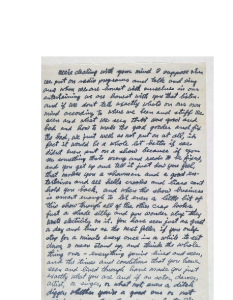 The author of the article, initialed E.B.M., writes a sort of review or advertisement for Guthrie’s Bound for Glory, his autobiography published earlier that year. Acknowledging his musical prowess, she tries to draw the reader’s attention to “a book that will fascinate you, keep you awake at night.” She even goes on to call it “another of the great stories of America.” The autobiography itself details his life of travels through 44 of the United States. It tells a sad story of Guthrie starting out on his own at the age of 12 when his mother was placed in an asylum. Never resorting to begging, he painted signs or played music and sang for the money he earned. His story claims that he was even a fortune-teller in Texas at one point. 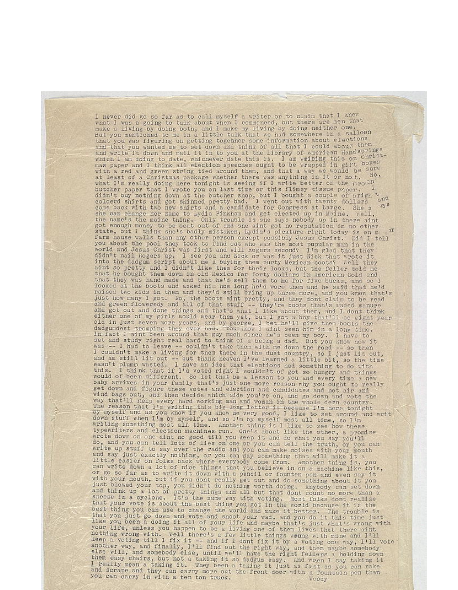 E.B.M strongly points out Guthrie’s aversion to riches, quoting parts of his story when he ran away from his aunt (who led him out of the Texas dustbowl) after seeing her mansion, and how he left his $75 per week singing job in New York. So why is this all important? The answer to that question lies in the ideals of folk music. As folk expert and Folkway Records founder Moses Asch explains, “folk means people, and this in turn means all of us, folk represents all of us.”1 This is what connects Woody Guthrie’s music, but also importantly his story, to the rest of us people. Asch goes on to say that “folk expressions are…so identified with the people who use them that they express conscious and subconscious feelings and experiences.”2 Guthrie’s story is that of a common man’s identity in folk — the story of a young, poor, boy who finds his life in music. Turning away (at least he claims) from fame and riches for the authenticity of folk ideals, his story can indeed represent all of us. Even without fame or riches, we can tell our own story, a book “bound” with glory. 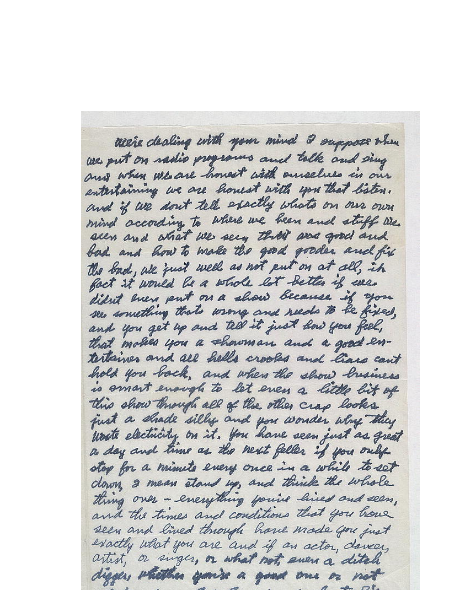 These letters of Woodie Guthrie help shed light on his passion, philosophy, and music. And as primary source material, as well as Guthrie’s own words, they can be relied on quite strongly to gain insight into Guthrie’s understanding of his life and musical career.